Java island is in the southern hemisphere. It takes 7 and a half hours From Tokyo to Jakarta by airplane and it is rather closer from Australia. Since the ASEAN headquarters and natural resource such as natural gas is abundant, there are many Japanese companies in Jakarta, and 30 thousand Japanese reside. Recently, the number of travelers coming to Japan from Indonesia has also increased. There are direct flights between Tokyo – Jakarta, 3 flights from Haneda / Narita, 6 flights per day. When arriving in Jakarta, normally you go to your hotel by taxi such as black Mercedes of Silverbird, but you have to anticipate to get caught in a traffic jam depending on the time of arrival. 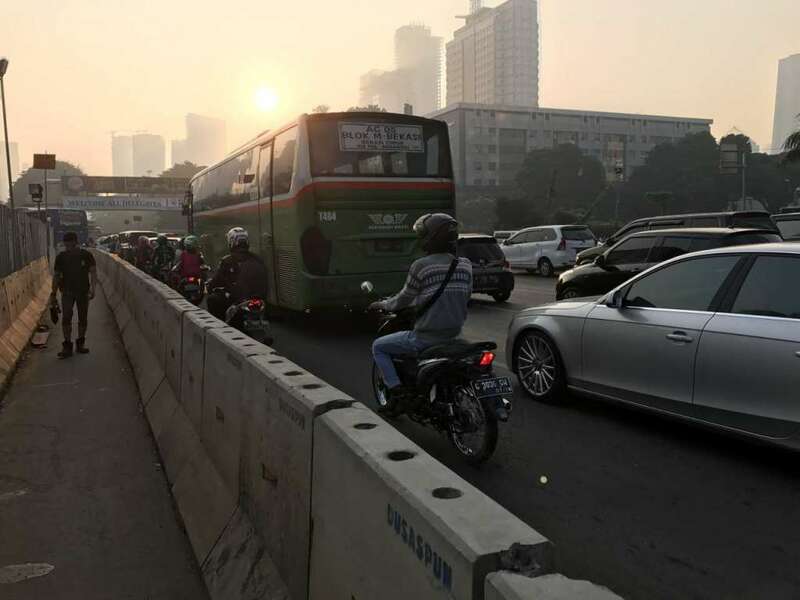 It is about 25 km from Soekarno-Hatta Airport to the city center and only needs 30 minutes to reach when the traffic volume is not heavy, but it may take up to 2 hours or more if you have bad luck. Traffic jams in the Indonesian language is macet (mɑʧet). Taxi drivers and other drivers are all used to it, and they do not seem especially irritated. From last August when the Asian Games was held, they have taken measures to restrict the number of odd and even numbers of license plates in certain areas of the central urban area, but the effect of it seems to be limited. In this urban area, which is also said to have a population of 33 million people, the necessity of public transportation has been scouted for a long time, but in addition to BRT (transit · Jakarta bus, rapid transit system with the exclusive lane), they at last started construction of the JMRT (subway) and the train from the city center to the airport has started service. Will there be a day when we will not see macets?